I promise to make more of an effort with this blog, which I have neglected of late. 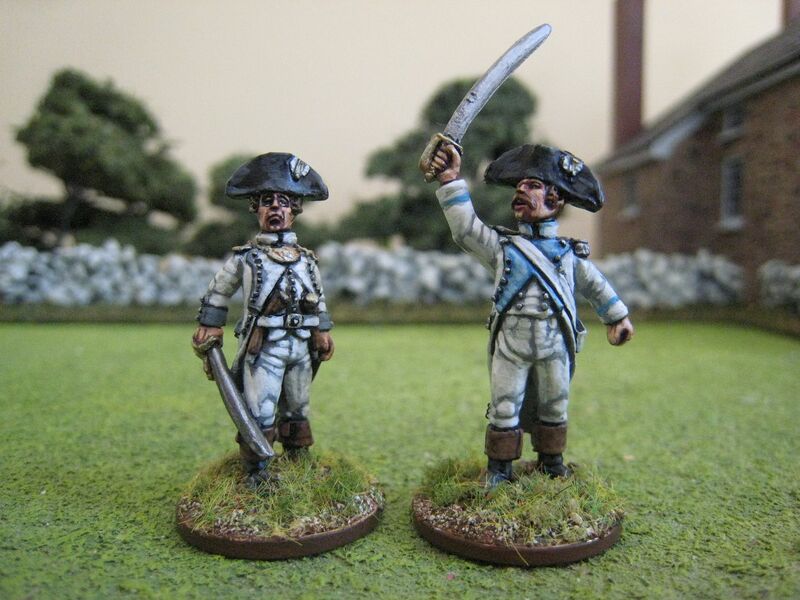 As an hors d'oeuvre to some more substantial posts on AWI French units I offer this trio of figures from Eureka Miniatures' Revolutionary Wars range. I think this range is useful to the 25mm AWI gamer, although there are issues with the uniforms, principally the shape of the hats and the absence of water bottles. The coats of the figures are long, but that suits the 1779 ordinance and Chartrand in his Osprey refers to the "ample and generous" cut of the 1779 coats; so this point isn't too much of a worry. The hats are another thing, although I think the hats here are ok and I will shortly post about some chasseur skirmishers which really do require a leap of faith re their headgear. The two officer figures here are listed in the Eureka range as "officer encouraging skirmishers" (the chap brandishing the sword) and "artillery officer" (the chap with the brace of pistols). I think they are very characterful sculpts and look pretty good in AWI white rather than 1790s blue. I am working on a 24-figure unit of chasseurs which will have 4 bases of 6 figures, all of which will be rank and file (for reasons I'll explain when I do a post on the unit itself). The purpose of the two Eureka officer figures is to provide some visual command for this 24-figure unit, which otherwise will lack any command figures. I expect I'll place them in front of the unit or one figure at each end. They can also act as command for the 8-figure chasseur skirmish unit I've just finished. The chap waving the sword is from the Armagnac regiment and the other is from the Viennois regiment (in 1779 dress). The looter vignette took some time to plan. My original idea was to have a Hessian plundering a Frenchman - as the plunderer has a moustache I couldn't paint him as a British soldier or an American. But then it occured to me that the uniform was wrong and it wouldn't make sense for a Hessian to be outside the lines (of, say, Savannah or Yorktown) nicking stuff off a dead Frenchman. But is also seemed odd that a French soldier, probably recently arrived, would be as badly dressed as the looter is here. In the end, I decided that the looter was a deserter in search of extra provisions, who is still wearing his uniform coat (from the Auxerrois regiment) but has found local trousers and is in search of other items. 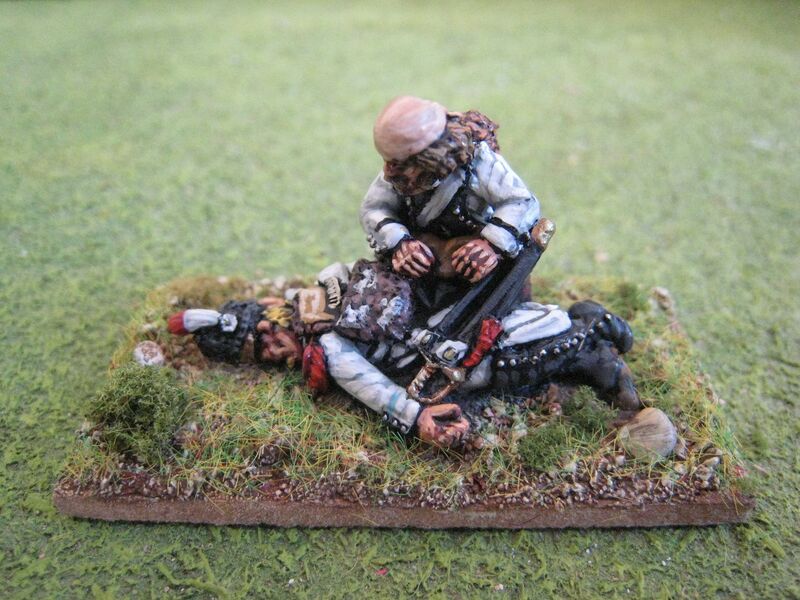 The dead grenadier is from the Armagnac regiment again. I filed off the grenade on the ammunition box but left the chain on the bearskin, simply not painting it black. 4 figures. Painted June 2011. ...or is it? Actually, this is the street around the corner from the house which we are hoping to buy. On Saturday we accepted an offer on our place in Wapping, east London, and had an offer accepted on the house we want to buy in Chelmsford (further east, about 1.25 hours' drive from London). This domestic hooray wouldn't merit a post if it wasn't for the fact that the house we are buying (if all goes well) has been built in the "New England style". 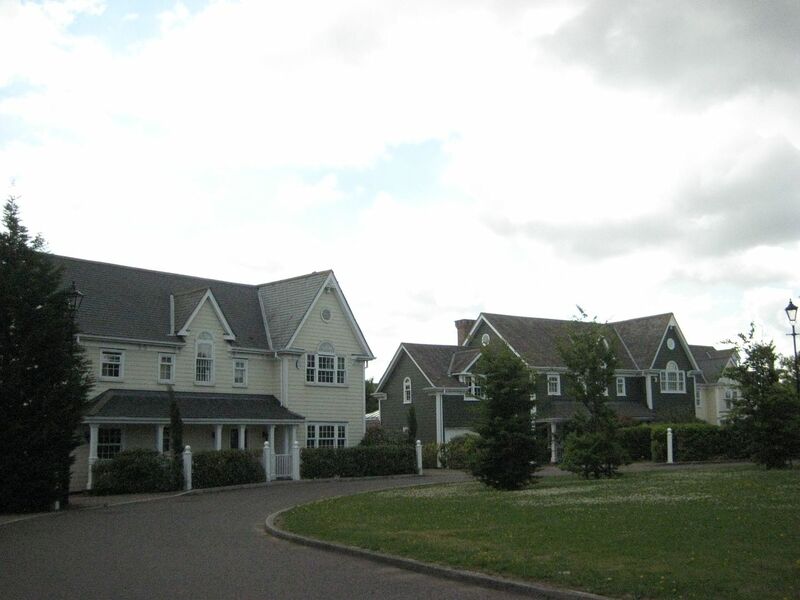 When I first saw the area I thought "this looks a bit familiar" and I asked the estate agent whether it was just me or had the houses been built with a New England vibe in mind. 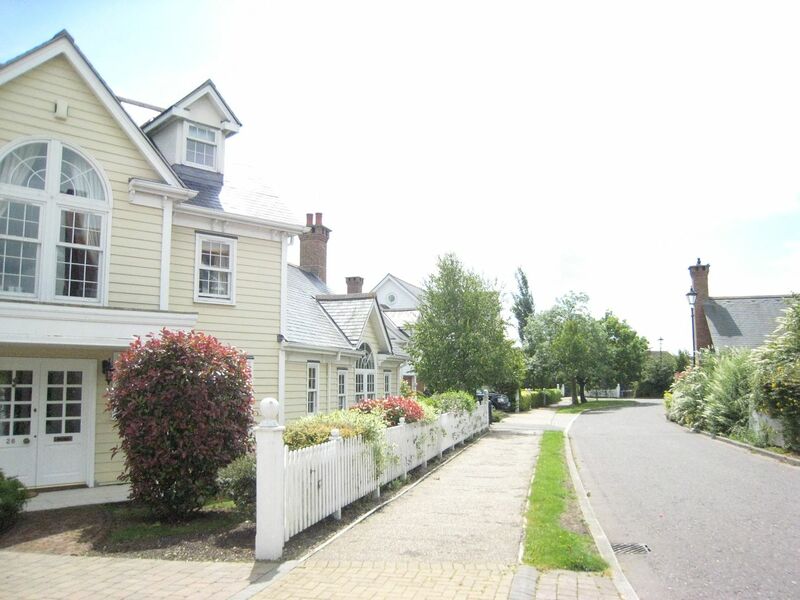 He replied that indeed this part of the development was supposed to have a New England, clapboard look and that the house we are now buying was built "to the Stockbridge design". I'm not sure what that means, but it sounds pretty American to me. British readers won't be surprised by anything that happens in Essex, but I like to think that we've managed to buy a house that's almost an AWI house. 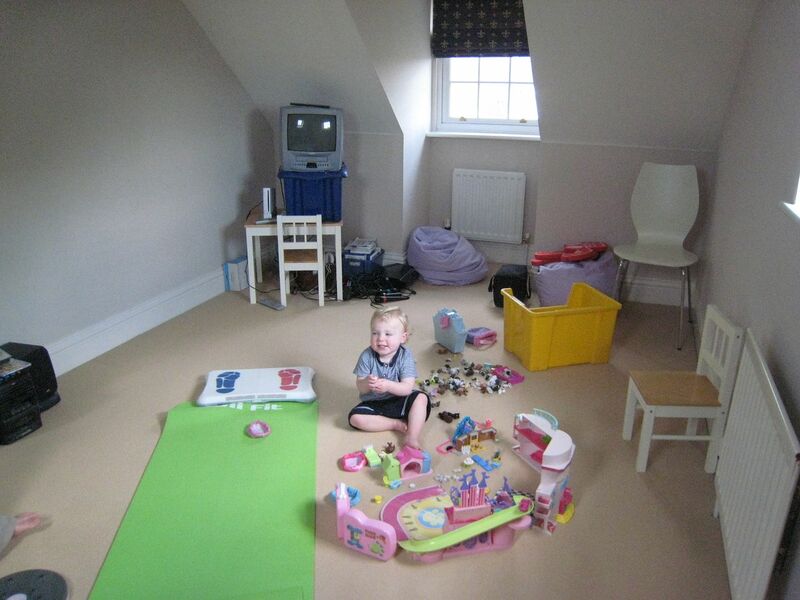 Even better, my new painting room looks large enough to accommodate a gaming table (as per photos below), which will mean that for the first time I will be able to have a permanent set-up. The road from offer to completion is fraught with difficulties, but we are slowly moving along it and I'll have to ensure I maximise painting time before the move. ...for the lack of posts recently. 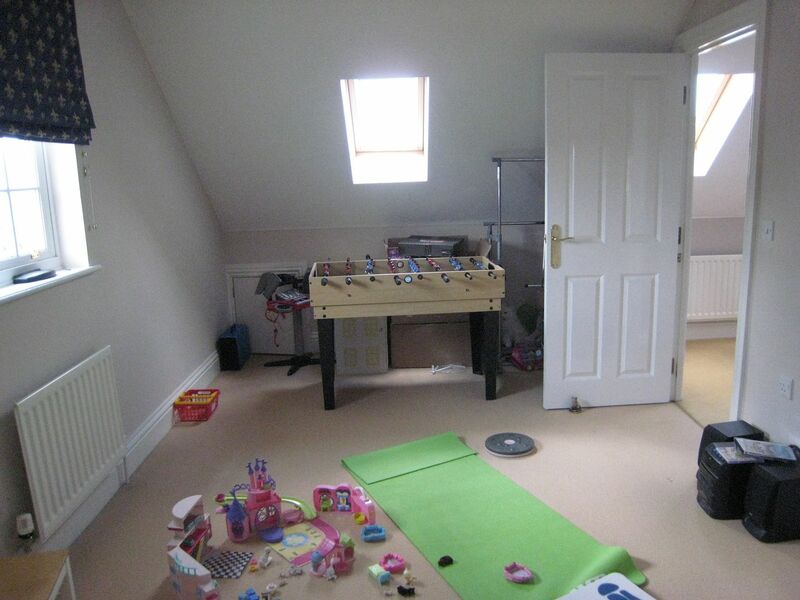 I've been hit by the joint effect of a very busy period at work and the need to empty the house prior to it being put on the market. That has now happened and each weekend is now spent travelling around Essex looking at houses, so eroding further on painting and posting time. 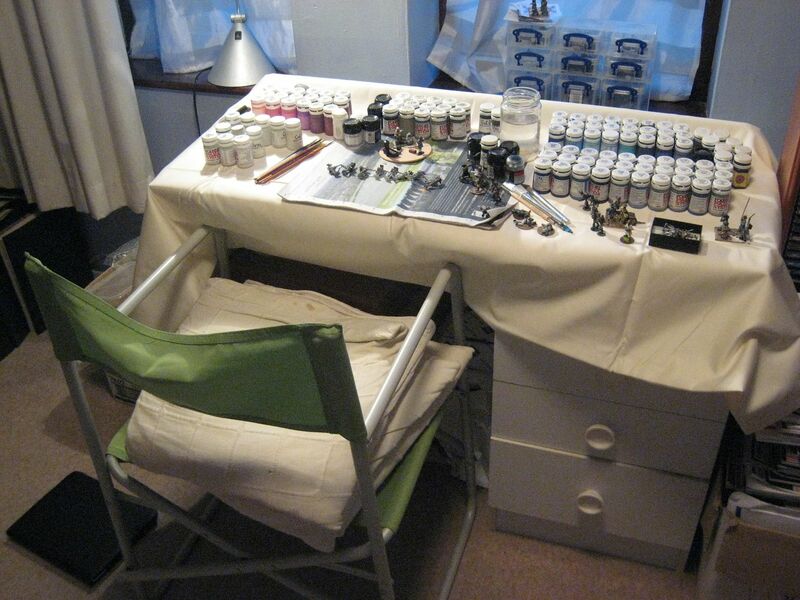 Tidying-up the house led to the decision about what to do with all my painting stuff: do I put it away completely, or have the essentials only, or stand proud and keep everything out? I realised that I could empty the drawers of my desk and stick most of my paints in them - no longer are they standing on the floor and window-sills in a variety of grubby boxes and I'm much happier for it. Most of the lead-pile is now in storage, and much else besides. Sorting through heaps of boxes filled with figures and various bits and bobs was also wuite cathartic. I have found figures that have been half or part-painted for years and I'm going to finish these off over the next few weeks. I once tried to include at least one such figure in each painting batch but that plan didn't survive more than a week or so. This time I will try harder. Anyway, viewers of the house can't mind my residual painting stuff too much since we had out first offer today, and the house only went on the market last Thursday. Above is a wip shot of the AWI French chasseur unit I am slowly working on. I'm exactly half-way through, with 12 figures completed. 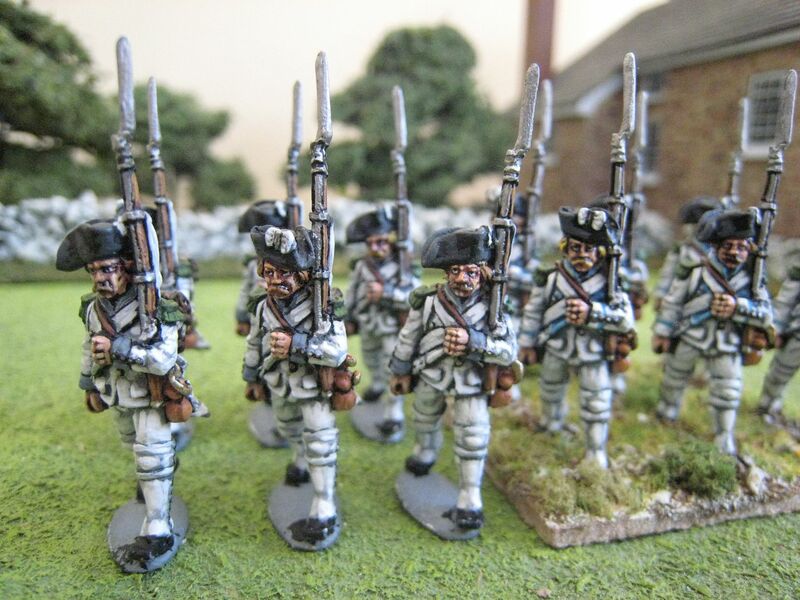 This week I'm painting 8 Eureka Revolutionary Wars French figures as chasseur skirmishers. The Gatinois regiment has now been photographed and I'll try to post on that later this week, together with the 15mm stuff. 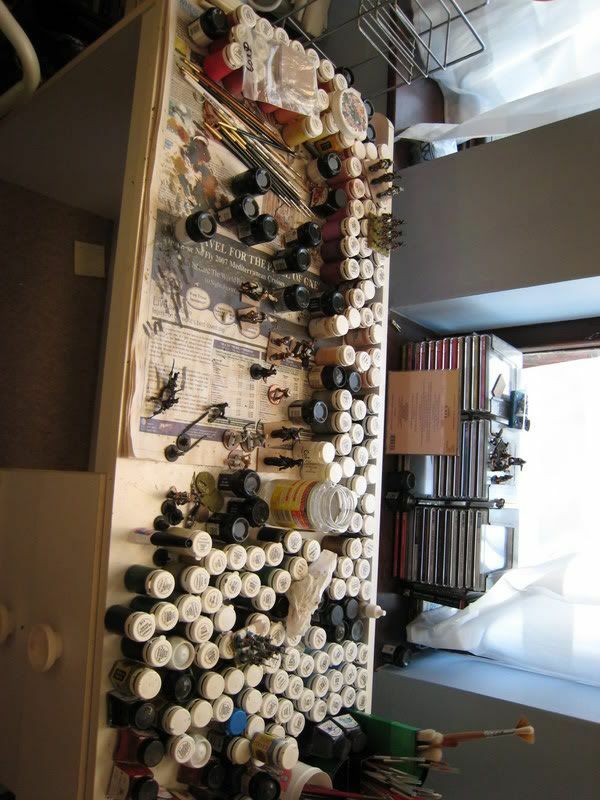 Below are "before and after" photos of my painting desk! Finally - a big "Happy 4th of July" to all my American friends, followers and readers!